The ESA asked people to use their imagery of the Comet 67P/Churyumov-Gerasimenko. They released an archive of photos under the CC BY-SA. I took them, threw them into a trial version of Agisoft Photoscan and generated a textured mesh in it. I then exported it as .obj-model, loaded it in Blender and exported it to a WebGL scene with blend4web. In other words, I just threw some programs at it. You can see the result in your browser at http://hannes.enjoys.it/geo/67p.html (~7 Megabytes). Be aware that while I used a lower quality version for this web version, the higher quality versions I tried were not actually that much “better”. The quality is limited by the resolution of the imagery and of course the fact that we do not have full coverage of a well-lit comet. Still totally fascinating and lots of fun to try. You can download a higher quality .obj at http://hannes.enjoys.it/geo/67p.7z (~12 Megabytes), you can import that straight into Blender. PS: I should add that I have not used Photoscan without ground control points for a completely foreign object before. Someone with more experience should be able to get a better result out of it. If you do and you read this, please share your wisdom! 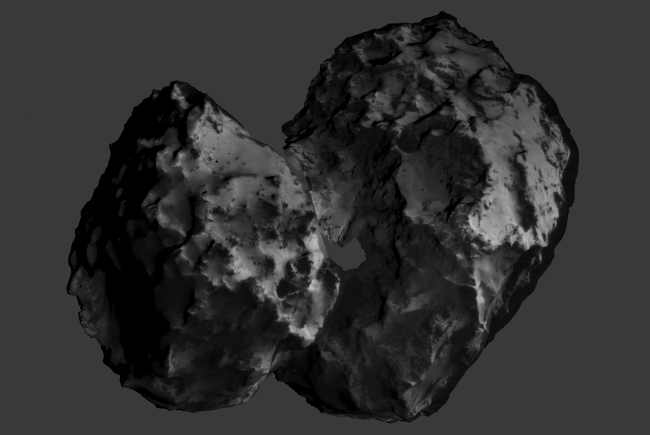 This entry was posted in linux, photogrammetry, rosetta on 2014-12-22 by Hannes. Nice job. Indeed very fun to be able to rotate Tchury on my screen. I observe culling back faces, for which reason the model does not look solid. Is it desired behavior? If not, you might consider to recalculate normals in Blender. Well, I understand that you only have a surface, not a solid object. Perhaps disabling backface culling in Blender settings will help this model to look better. The images are very incomplete, the backside is in darkness so I could only get a partial surface out of it. I should have called it that but thought “partial model” might be easier to understand for random people. I’ll try the culling toggle.